The notion that learning is in doing, and that the intellectual component of learning has been vastly overemphasized, has been a central theme of this blog. An exemplar of this practical truth is the art of Aikido, which you cannot learn from reading a book and looking at videos. No, you actually have to get out and do the physical practice, monitor the results of your physical movements, and make assessments about how to move more effectively based on those observations. Often we need help interpreting the training outcomes, and that is where teachers and fellow students come in. But for all its value, I do not believe that we are able, in any robust way, to transfer the physical learning of Aikido, the blending with and taking care of our adversary, to the everyday world of speaking and listening. Instead, I believe that we begin to act petty, vindictive, manipulative, and controlling as soon as our interests and concerns appear threatened. Chris Argyris declares that these reactions to threat are not to be considered mistakes or shortcomings, even though they may conflict with our espoused values of collaborativeness, fair play, and considering all sides of an issue. Instead, he says, these destructive responses are expert behavior, fully informed by and consistent with other long-established values we have habitually drawn on to actually drive behavior. These values, or principles, can include: "win, and do not lose," "own and control the field of play," "suppress negative feelings," and "always appear rational." That we are usually not aware of this does not, according to Argyris, absolve us of responsibility for the consequences of our actions. Argyris's claim is that, consciously or not, most of our habitual problem solving actions, in stressful situations, are designed to enact one or more of these default values. The reason we are so expert at these behaviors, performing them flawlessly and without thought, is that we have already had so much practice. If Argyris is correct, then it is no wonder that these default habits are so hard to deselect, in favor of more collaborative actions drawing on new values such as: "propagate valid information" (don't lie), "don't manipulate people without their consent," and "let people choose for themselves." The fact that these noble-seeming values are out of sync with our usual self-serving actions doesn't mean we're weak or bad, it just means, according to Argyris, that we're acting consistently with other values, in ways we have practiced all our lives. But it also means we're incompetent to enact the values we espouse, however sincerely; and moreover, we are unaware of this. 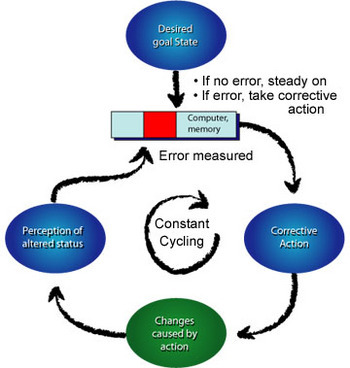 The graphic on the left shows an action system designed to act according to the value "own and control the process." Simply adopting a new value, "support collaborative decision-making," will not be sufficient to creating new behavior. If new actions are to become available, they must be practiced, just like the old ones have been. For Aikido people wishing to act consistently with such values as, "see the other's perspective," "blend, don't fight," and "preserve the health and dignity of everyone in the loop," it may be important to realize that powerful behavioral habits designed to "own and control" the situation and "win at all costs," are already on-line, waiting to be triggered by some everyday life situation. What's more, these default habits are so well practiced and in our bodies that we will probably not be able to eliminate them. But with conscious practice we can become competent with additional actions, actions consistent with new values more conducive to effective communication in complex situations. In Aikido practice on the mat it often takes a few years to realize that applying strength to force a technique to completion results in bad technique, and sometimes injury. In such cases, our long-established practice to try and "win" in situations has taken over. In time and practice on the mat, however, we begin to trust that we can apply techniques in ways that do not force people to the ground, but simply use their energy to take them where they were already headed, and in a way that neither hurts nor awakens fighting instincts. If it takes a long time to be able to create habits of non-fighting effectiveness in the relatively simple universe of the training mat, why wouldn't it take a similar amount of time and effort to learn new actions in the more complex world of everyday speaking and listening? I think it does take time and effort. If my assumption is correct that we need to practice specific kinds of actions that embody collaborative values in the actual domains in which we will use them, then just studying Aikido on the mat will not help much out in the world. Other habitual behaviors for use in the world will just take over before we can even imagine doing anything different. If correct, then to act differently and more collaboratively in the world, we'll need to design learning methods and practices for situations we are actually likely to encounter out in the world. Of course, this is how we learn Aikido. Someone punches or grabs you; you execute a technique. If everyday world encounters were full of punches and grabs, then Aikido would be perfectly good training. But the everyday world is mostly full of people speaking and not punching. Therefore, it makes sense that we might need to design different kinds of training to put Aikido values to use in the off-mat world of speaking and listening. Finally, it makes sense to design the training methods themselves to embody the values that we intend the training to teach. This means, for instance, that methods of teaching that trick or manipulate people, denying them free and informed consent to the process, may be considered inconsistent with the values the teachers espouse, and therefore examples of the very kinds of actions we are trying to avoid. Indeed, noticing inconsistencies between espoused values and observed actions is an important part of the new methodology. In part 4 I'll try to describe in more systematic detail a prototype methodology for teaching everyday skills of speaking and listening that will embody Aikido values out in the world, and that will be itself consistent with these values. Robert Chevalier reminds me in email of how our popular conception of ourselves-as-isolated-actors-in-the-world can be a serious handicap to increasing our success in ordinary activities, whether they be Aikido, dancing with another, or simply crossing a street. A teaching of Aikido is that we are connected by a kind of universal mind, and that at the very least we ought to act toward one another in recognition that we can be nodes of a larger system. In Aikido a version of that larger system is the one that emerges to include both attacker and defender. It is a dynamic system that manifests in leverage, potentialities, energy flows, and physical throws that can not exist on the level of just individuals. Couples dancing, moving together as one organism, provide another exemplar of individuals playing with energies arising in a larger system of action, one beyond the domain of solitary actors. Yet, in Aikido and in other daily pursuits, we see individuals acting unilaterally as solitary agents, pushing others around, without recognition that they are more like transformers of information embedded in a larger web of people and relationships. Aikido students who do this are easy to spot. They seem to be powering through their techniques, relying on their own physical strength to force their partners into throws. To an observer, this kind of practice has an ungainly, ungraceful appearance. In terms of cybernetics, it is an approach to training that doesn't recognize or utilize the larger information feedback circuitry that includes both defender and attacker, the mat, and other important concrete elements. Gregory Bateson suggested that living in conscious awareness of this potentially vast arc of feedback circuitry was to locate "mind" everywhere in the system, not just in your own brain. Thinking this way has interesting consequences, not the least of which are that the customary idea of "self" as that of a solitary, isolated individual begins to define a small game. Bateson explained it with a thought experiment. Imagine a blind person walking down the street. Where is does the blind person end? At his hand? Half way down the white cane? At the end of the white cane? In terms that describe the practical flow of information that the blind person uses and transforms to get across a street, a more relevant and pragmatic model of the blind person would show the particular information circuitry in play, a circuitry not limited to the edge of the body but arcing through it in a larger loop, carrying transforms both radiating out into the world and feeding back in. Thus, thinking of the blind person as a solitary "self" is a conceptual obstacle to understanding how he or she actually operates in the world. To shed the notion of isolated selfhood opens the possibility of seeing "mind" as unlimited in scope, enlivening and inhabiting ad hoc information networks established essentially on the fly. Using this same logic, in Aikido we can flood mind into on-the-fly information loops limited in scope only by our ability to concentrate them into existence. From this perspective, to do Aikido only from within the boundary of one's skin is to completely miss the party. Aikido is a Cybernetic activity. In short, this means that in performing Aikido, one makes on-the-fly, real-time corrections or adjustments based on how the application of the technique is or isn't working out. The ability to make such mid-course corrections shows that the person enacting them is cybernetic. Cybernetics is the science of systems that can take corrective action in order to maintain some sort of control in their environment. People are cybernetic, and so are bean sprouts. People use their cybernetic abilities in things like riding a bike, making constant micro-shifts in balance and position to stay upright on the bike and to travel in the right direction. Bean sprouts show off their cybernetic abilities in bending around obstacles to present their leaves to the sun. To be cybernetic a system/organism only needs the following components. A capacity for behavior in the form of corrective action, just in case the computer returns an difference big enough to be important. Additionally, it helps to have an appropriate ability to store memories, such as memories of how well or poorly the last corrective action worked, and of course, memory of the desired goal state. Tie all the components together in a circular information circuit, program a goal state, and then set the thing in constant cycling motion. Voila: a cybernetic system. People and bean sprouts all have the parts wired up the right way for them to do cybernetics. It may seem a trivial point to say that Aikido is cybernetic. Well, of course it is; Aikido is an activity aimed at correcting a violent exchange by restoring peace. It's important to note that Aikido is not a response to the attack; this is a kind of thinking that we inherited from behaviorist psychologists that caught hold in popular thinking. Rather, Aikido is an action taken to restore things to a goal state, that of peace. This is not just a minor difference of words, but an important distinction with pragmatic consequences either way. A good resource for exploring this distinction and other aspects of cybernetics is the work of William Powers. Even though people have the necessary and sufficient components and wiring to behave cybernetically, we sometimes elect not to do so. I have posted here about doing Aikido without paying attention to uke or the unfolding technique, but just plowing through the motions, regardless of how much force is necessary to drive someone to the mat. One of the aspects of Aikido that make it beautiful to watch is the expression in motion of the cybernetic connection fully maintained. Years ago I had the good luck to see an Aikido exercise performed in which two partners moved constantly to uproot the other. The centers of gravity and balance of both were changing constantly as each one moved with the other's energy and momentum, looking for some small vulnerability. Back and forth the exercise flowed like waves moving up and back on a beach. You could feel the single-pointed focus of each partner on the other and the unfolding dynamics of the exercise. Push-hands in Tai Chi is another demonstration of this kind of cybernetically live exchange. As it turns out, social science researchers such as Chris Argyris have used this same cybernetic model to explain how and how we cause trouble in everyday speaking and listening despite our best intentions. He and his colleagues have developed cybernetic exercises and practices aimed at helping people speak and communicate more effectively in everyday life to achieve the goals we espouse. In Part 3 we'll begin to explore how Argyris's cybernetic theory of effective communication may show promise and avoid some common pitfalls of many leadership and conflict management methods. Additionally, we'll look at some possible short-comings of Argyris's method that could be corrected by widening the bandwidth of communication to include assessments about mood. Finally, somewhere down the road, I want to try to show how the Action Learning methodology, of which Argyris is an key architect, can be usefully seen as a kind of Aikido in speaking and listening.